I have a very pretty nail polish on my fingers on this day. It's by Mentality. Mentality Nail Polish. It's called Moe. There's also Eeny, Meeny and Miney, but I only own Moe. So here's Moe. 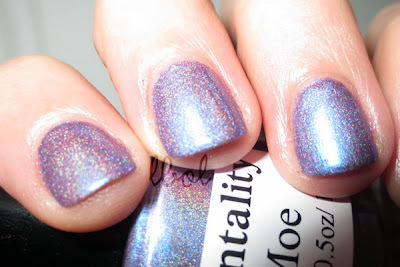 Moe's, like, this lavender base with a strong blue flash and subtle linear holo. It was pretty much opaque after two coats but there's three here just in case. Applied like a champion. Also a coat of Essie Good to Go topcoat is on top... coat. Is this even a review? I don't know. The brush was nice and wider than your average, normal brush (but not OPI wide) and I already told you that it applied nicely. And it's pretty to look at. So, I guess the bases are covered. I'm pretty sure. I really like it, though, like a lot. 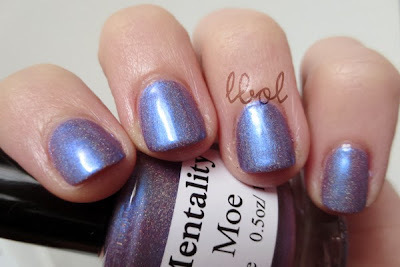 I'm going to be owning quite a few more Mentality Nail Polish polishes in the future. But hopefully not too far in the future. Fun Story: I got my first Lynnderella in the mail today (which I shall show you tomorrow because that's how I do things, okay?) and it's called Mlle. Violette de Bleu. Do you want to know how I got it, even? Well, I sold a polish to a girl, and this girl, she decides to send me this Lynnderella JUST BECAUSE. Jenne, you are my spirit animal. That's pretty much the highest compliment I can give to a person. Hey. I'm pretty excited for Christmas.